Is White going to kill or capture? There is a possibly subtle difference between killing and capturing. The beginner wishing to get stronger at fighting should definitely distinguish between the two. Roughly speaking, a capturing move is a move which eliminates opponent stones' liberties while a killing move is a move which eliminates opponent stones' eye space. Eyes and liberties are two different (but not exclusive) tactical resources a group of stones can have; with enough liberties, even a group with no eyes can capture a group with one eye. Therefore we should look at these resources differently. If we must capture opponent stones so that our own stones may live, then we should make capturing moves which directly remove liberties; however, if we do not need to capture stones, efficient killing moves which eliminate eye space are preferable. When we are very powerful locally, our thoughts should focus on solid, dual-purpose moves (moves which combine both attack and defense) aiming at preventing two eyes. Here is an example from a beginner's game. In this example, White has some cutting points and imperfect shape in the center. Black cuts with to see if he can make anything of the aji. White considers these stones as hers: White thinks these black stones are dead. Often, the beginner mistake is to play vulgar capturing moves to assert this position when killing moves are all that are necessary. Indeed, playing capturing moves can create liabilities since contact plays can make both players' stones short of liberties. here is an example of a capturing move: White directly removes a liberty from black's stones. One can almost hear White yelling, "I'm going to capture you!" While it is true that this move exerts the maximum pressure on the liberties of the black stones, it also puts the exact same pressure on the liberties of the white stones. is a dangerous line. Black only needs to capture something to escape or make eyes, he can sacrifice any number of stones in this area to accomplish this goal as the alternative is that they all die. Thus, when we want to kill, capturing stones (or otherwise making capturing moves) might be playing right into our opponent's plans! 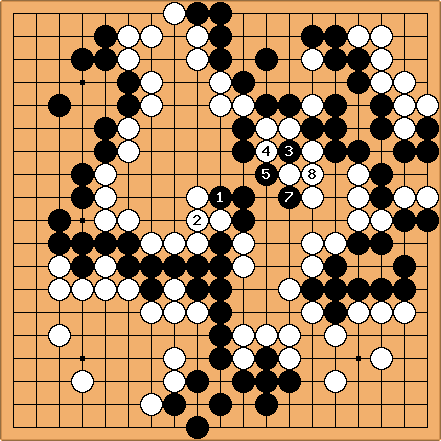 White is confident that Black does not have enough room for two eyes, and so plays here to both use up the black stones' potential eyespace in the center as well as keep her own stones strong. In difficult positions like capturing races, killing moves are necessarily capturing moves, but this is a special case. If we can kill stones without capturing them, we have likely played efficiently. See semedori. A notion somewhat related to the difference between killing versus capturing is discussed at Beginners Play Atari. An atari is the epitome of a capturing move. : The example is chosen not on the basis of whether black can actually make something of the aji or not given white's play, but only because it clearly illustrates the difference between the two ideas. A play isn't vulgar because it is unsuccessful but because it lacks an application of go fundamentals. Similarly, the question here is not whether the capturing move somehow does or doesn't work. B has one too many forcing moves. In this diagram, prevents black driving the marked white stones down and then cutting at the marked point with atari, resulting in a big capture. is also necessary as black has a sequence ending in a snapback at the marked point. In summary, as white, I would go for the solid connection rather than the hanging connection, simply because it gives fewer forcing moves. Anonymous Response: A white move is necessary, but is back to capturing mode. Try putting one intersection to the right. Phelan: to the right seems better, yes. Nonetheless, Warfreak2's point is still valid. White would have much more room to maneuver with a solid connection to start. White would simply be trying to fix any defects in shape, since Black has no eyes to start, and has to use forcing moves to get them. In 1978, Winfried Dörholt, later president of the German Go Federation, published the introductory go book Das japanische Brettspiel Go, in which the terms captured and killed are in fact used switched. Sobald ein Stein keine Freiheit mehr hat, ist er getötet und muß vom Brett genommen werden. [...] Die Abb. 11 zeigt gefangene Steine. S hat die w Steine vollkommen eingeschlossen, sie können nicht entkommen [...]. Die w Steine haben aber noch innerhalb der s Umklammerung 1 Freiheit behalten; sie sind also noch nicht tot [...]. As soon a stone has no more liberty, it is killed and has to be taken off the board [...]. Dia. 11 shows captured stones. B completely enclosed the w stones, they can not escape [...]. But the w stones still kept 1 liberty inside the b enclosure; they are therefore not yet dead [...]. Fits nice with "can't escape", but not so good to "not alive". Wonder why he did it. Can't remember that this was the usage in Germany (or anywhere else), and his occasional slips don't suggest: p. 12, "fünf Punkte Komi, das sind fünf gefangene Steine im voraus" ("five points komi, that's five captured stones in advance"), or p. 95, "Nach W 138 sind die s Steine immer noch tot" ("After W 138 the b stones are still dead"). Tas: Well, it would make sense to say that stones are captured first, and then later can be "excecuted" (killed) if there is risk of an escape. I find it strange that we use the words the other way around.